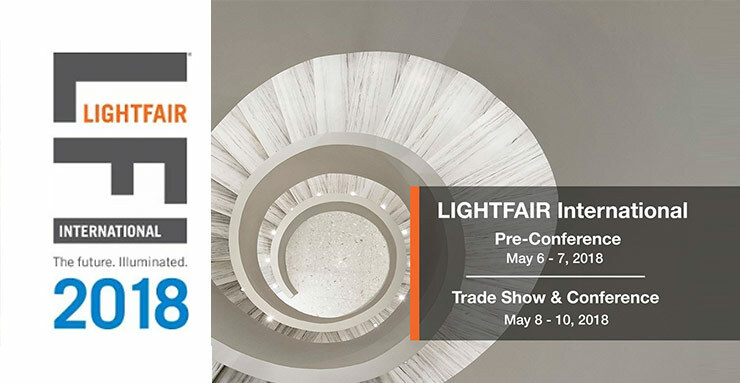 I attended LIGHTFAIR 2018 in Chicago last month. This is the lighting industry’s big annual tradeshow in North America. I went primarily for a daylong forum on “Light and Human Health”, but in the end what I observed on the tradeshow floor was far more interesting. Below are my top three takeaways from this year’s event. 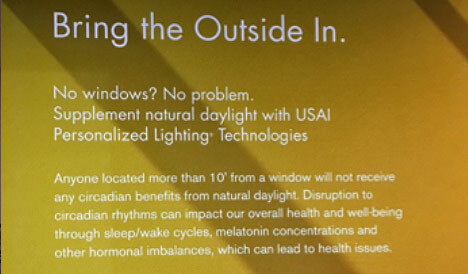 “Human Centric Lighting” was the buzzword (or phrase) of the show: the big players in the lighting industry have clearly been quick to embrace the data regarding how different spectrums and intensity of sunlight impact human health. Many called this “human centric lighting”, or some variant of this phrase. Cree, Samsung, Eaton, USAI, GE and many more featured content on this subject in their booths. In many ways this is quite positive. Our increased understanding of how light impacts human health has opened up avenues for the lighting industry to, in essence, better mimic natural light in order to support human health. However, a desire to drive health and wellbeing is not the only issue at play. The trend towards more and more glazing for daylighting typically comes at the expense of lighting power density. This means the lighting industry sells less lights. As the booth display below shows, part of the focus on human centric lighting is an attempt to reverse this trend. Human Centric lighting + biomimicry: Cree definitely wins “most creative booth experience” at the show, at least from my perspective. Within their large booth area they had a closed off section, velvet rope and all, and would usher people in up to ten at a time for a two-minute demonstration. It was a simple white room with plants and pictures of outdoor scenes on the walls. There was a pseudo-skylight at the top, actually LEDs designed to look like a skylight. Over speakers came the soothing voice of a narrator who expounded on the benefits of nature and a connection to the outdoors. 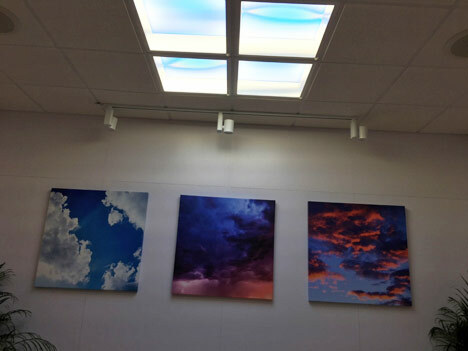 As she spoke, the light from the “skylight” changed, from bright and warm, like the morning sun, to gradually cooler to imitate how daylight changes over a day (in a time lapse manner). The light even changed to replicate passing clouds. Overlaid with the narrator’s voice were sounds of nature, from birds chirping to crickets…I guess also chirping (I had to look this up, apparently what they do is also called a chirp). It was interesting and compelling, but it left me wondering: is this biophilic design or biomimicry? Biophilic design vs. biomimicry. I left the experience thinking Cree did an excellent job of using technology to mimic and evoke multiple natural elements. However, I was forced to ask, was this biophilic design or biomimicry? As I did so I realized I couldn’t intelligently articulate the difference between the two. It seems I am not alone, as Greenbiz dedicated an article last October to this very subject. The article summarizes the distinction this way: “Biomimicry is an innovation method to achieve better performance; biophilic design is an evidence-based design method to improve health and wellbeing”. By this definition, it appears the “Arcadia Experience” is indeed Biophilic design, and not biomimicry. But this didn’t totally sit right with me. What Cree did was intelligently mimic natural elements in order to improve health and wellbeing. A building designed with lots of glass, and lots of seating near it, along with natural elements to see outside would also be an example of biophilic design. But are these two equal? Is mimicking nature, even very well, the same as actually letting people experience it? This final question is not one I will attempt to answer…because the jury is still out. Researchers are actively examining this very subject, trying to understand how well “pseudo-nature” really meets peoples’ need for a connection to nature. This is something we will be writing about in the future. If nothing else, the intense emphasis on the connection of light and nature to human health serves as further evidence that this trend is growing and becoming even more mainstream.